Now that summer is finally here alternative dinner options are welcomed! 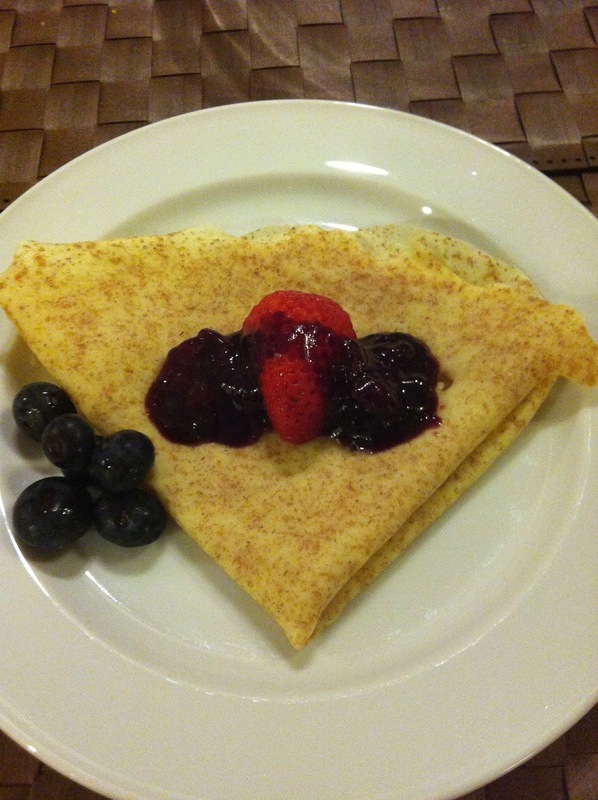 Crepes are nice light fare and are perfect for summer! What I love about crepes is that they can actually be eaten savoury or, what we often see, sweet. 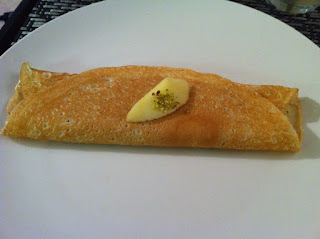 The crepe recipe that we have gotten lots of mileage from in our household is the one from Jacques Pepin. In a medium bowl whisk together the eggs, flour, milk, salt and sugar until smooth. The batter will be thick. Heat a 6-inch pan (or any flat pan- we use a stainless steel one) or a non stick skillet and rub with a bit of butter. Tilt the skillet to distribute the butter evenly. Add about 2 tbsp of batter (we use a ladle to put in how much we need; as long as it thinly covers the entire pan). 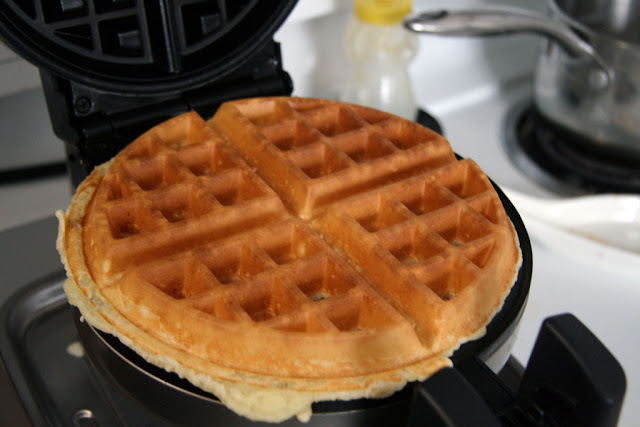 Tilt the skillet to distribute the batter evenly. Pour away any excess batter back into the bowl. Cook over moderately high heat until the edges of the crepe curl up and start to brown. approx. 45 sec. Flip the crepe and cook for another 10 seconds, until a few brown spots appear on the bottom. Repeat with remaining batter to make up to 12 crepes. You may need to butter the skillet a few times as time progresses. *note* heat low to medium heat first since you don't want to burn the crepe too fast. Once you see the edges turn then it is ready to be flipped. You can make a whole stack of crepes by stacking one on the other. Cover with a towel/plate to keep them warm. 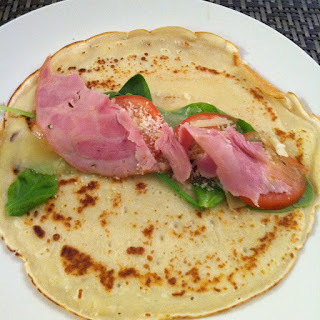 This recipe can be used to make savoury crepes by skipping the sugar and filling the crepes with slices of cheese, sandwich meat, spinach leaves, tomatoes, mushrooms and more! For dessert crepes you can put chocolate, strawberry/better compote (made with frozen fruit, butter & sugar in pot on stove top), or any types of fruit. Enjoy!! These look good! Plus such a simple recipe to follow! Thanks! 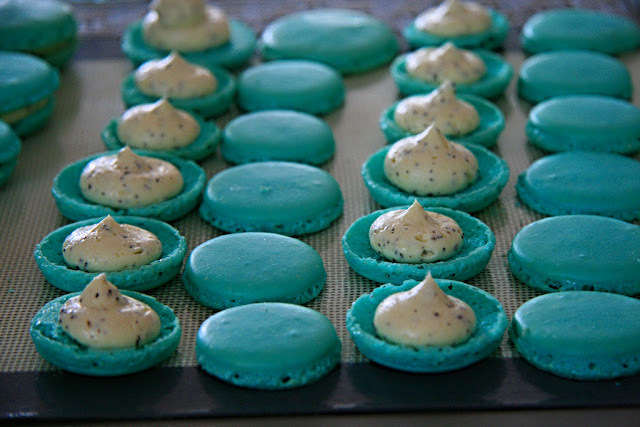 a chocolate tour- with Tasty Tours!